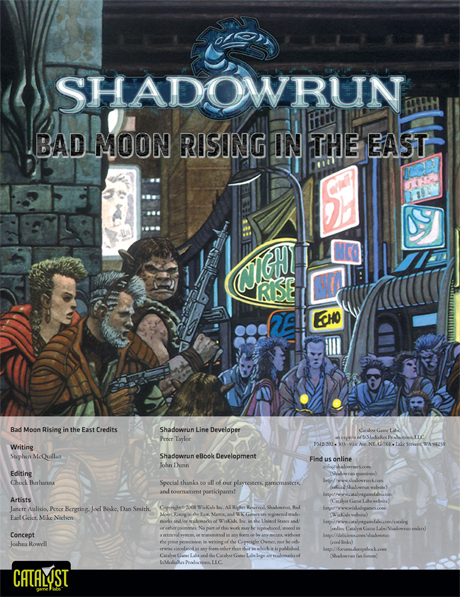 In Bad Moon Rising in the East, a team of shadowrunners is hired to track down the source of a new drug shipping into Hong Kong. 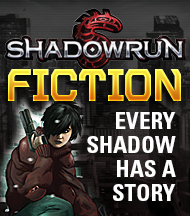 Directly connected to the Ghost Cartelscampaign, the team of six Caracas natives are thrust into a criminal underworld far from their home. With few contacts to turn to, they may find themselves deeply involved in a vicious underworld conflict.This 22-page scenario was used for the Gen Con 2008 Shadowrun tournament. 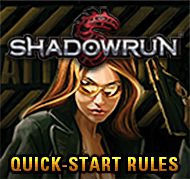 While it may be used with other characters, the included team of shadowrunners are fully fleshed out with contacts, backgrounds, and motivations. 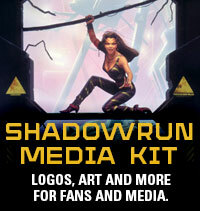 This complete package allows for a night or two of Shadowrun with little prep work for the gamemaster or the players.